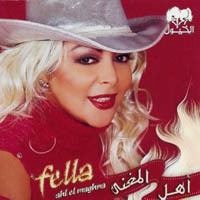 This page contains a translation into English of the lyrics to the song "Ahl el-Maghna", which was sung by an Algerian woman named Fella. The song titled is sometimes spelled "Ahl Ilmaghna", and the singer's name is sometimes spelled Filleh. It was a top hit in 2005. Also included is a transliteration of the Arabic lyrics into the Roman alphabet so you can sing along if you like. Mo kil shei ibyilma3 dahaban, abadan, abadan. Wala kil shei ghanna taraban, ghanna taraban. Ilmaghna ya ahl ilmaghna sayer 3ajaban. Fi maghna malou ma3na wala fi adaban. Not everything that shines is gold, never, never. and not every one sings for enjoyment, sings for enjoyment. Singing o' singing clans became wonders. There is a singing without meaning and moral. Ilmaghna fanno aseel. Illi ya3raif sirrow aleel. In kan fi ilsharq wala ilgharb wala fil mawaweel aw fi iltalyeen. Ya lail, Ya lail. Yaa Lail, Ah Ya Laily Ya, Ya, Ya, Ya Lail. Singing is a noble art. who knows its secrets are scares. If it was in the east or the west or even in the mawaweel or talayeen. O' night, o' night, o' night, aah my night, o', o', o', o' night. Fain yalli ghanno ya zamaan, Fain ilaghani ya, ya lail. O' time where are the ones that sang a long time ago ? where are the songs ? o', o' night. Fain illi saabo ajmal ma3ani. Kan iltarab wi ahl iltarab ilhom makaan, Iw dhaa3 iltarab iw ahl altarab sarait fi 3aali. Where are the ones who left the most beautiful meanings ? Songs and the singing clans used to have a prominent status. Songs got lost and the clans became up so high. Ilmaghna hayat ilrooh, tishfi ilalb almajrooh Singing is the soul life cure the wounded heart. Ooh, Ooooh, ooorrrrry. Oh Lo Lo Ley. Ooh, Ooooh, ooorrrrry. Oh Lo Lo Ley. Oy, Oy, Oy. Oyai, Oyai. Oy, Oy, Oy. Oyai, Oyai.